Attended GYV: as a Global Issues Workshop Instructor in 2003 and as a prep cook in 2006. Biography: I was born in 1972 in Tasmania, Australia and spent the first 20 years of my life there. From my earliest years, I was aware that there was a much larger world and endlessly dreamed of travelling. As soon as I graduated, I moved to Israel where I lived for several years as a yeshivah (rabbinical school) student, then a Kibbutznik in the Golan Heights & near the Judean desert. I was active in the Israeli peace movement and was deeply affected by my witnessing, as a naive Australian Jew, of the Palestinian experience. Although I left Israel in 1995, my time there has profoundly shaped my attitudes to issues of identity, nationalism, peace and basic love for humanity. After leaving Israel, I decided to become an English teacher. 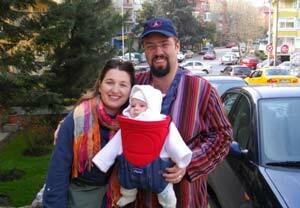 After two wonderful years in Prague and Gyor, Hungary, I made the fateful decision in 2000, to come to Turkey where I met my wife Ebru and, subsequently, have ended up an ‘honorary Turk’. Turkey is a rich, dynamic society with many echoes of the issues I faced in Israel. I love living at the nexus of European, Asian and Middle-Eastern culture. Living in Turkey also helped me to consolidate my long engagement with Islam. I finally took the step of embracing Islam, allowing me to explore the profundities and inner dimensions of this extraordinary religion as a participant rather than sympathetic observer. Since then, the teachings of Sufic Islam have subtly but profoundly reshaped my understanding of life and the world. In 2008, on December 14, the greatest happiness I have ever known came into my life in the form of my little daughter Ela Nur, and I have since discovered the indescribable joys (and trials) of being a Dad. Between my work on Bogazici University’s breathtakingly gorgeous campus and my much-treasured ‘Daddy-Daughter Time’, I try to follow and engage with the struggles of life in this amazing, chaotic, beautiful city in this breath-taking, mad, delirious country. My Memories of GYV: My wife first took me to GYV, having previously been a cabin counselor, and convinced me I would find the place inspiring. Actually, ‘inspirational’ seems a weak word for what seems to transpire, each time in its own unique way, as people from impossibly different backgrounds become drawn into such powerful, lasting friendships. It is astonishing to me to see how, even now, years after the GYV experience, so many people remain in close contact with each other. The life-changing power of GYV cannot be overestimated. I have been actively involved in GYV only twice, yet, whether we have an active position or not, my wife and I come back to visit almost every summer. GYV above all, inspires so deeply, because it shows us, in microcosm, a living example of how the whole world should and could be, if only we collectively dared to dream it. GYV is living proof that diverse people can live together in more than just tolerance, but mutual love, respect and friendship. At its best, GYV opens a window in the heart to what it is to be truly human in the sense of embracing the best of the potential in all of us. As an experience, it is unforgettable and transformational.